This Skinny Pork Chop Scaloppini recipe is simple and elegant, easy to prep and plate, and full of flavor bursts and complementary textures -- and pretty enough for company! My recipe for Pork Chops with Caramelized Onions is one of my all-time autumn favorites. It complements the natural sweetness of tender, meaty pork with that of onions, which have been sauteed until their sugars caramelize -- a quality emphasized by the addition of maple syrup to enhance their deep, rich seasonal color and flavor. As you'll see in the recipe I share with you here for sauteed pork chops, deglazing and reduction will yield a delicious sauce -- here, using orange juice as the deglazing liquid -- in a matter of minutes instead of hours. These crispy panko pork chops always do the trick. They are super simple to put together but still seem to have that extra spark. Paired with a buttery baked potato, tossed salad and a glass of rose? Yes, please! In the recipe that follows, tenderloins are split, filled with a Roquefort and herb stuffing, then roasted along with quartered pears. In summer, when corn is so abundant it is piled high at roadside farm stands or tumbling out of bins at the supermarket, buy a few ears to make this vivid corn and vegetable dish served with grilled kielbasa sausages. In the following main course dish, roast pork tenderloin is basted and served with a sauce of balsamic vinegar, garlic, tomato paste and maple syrup. 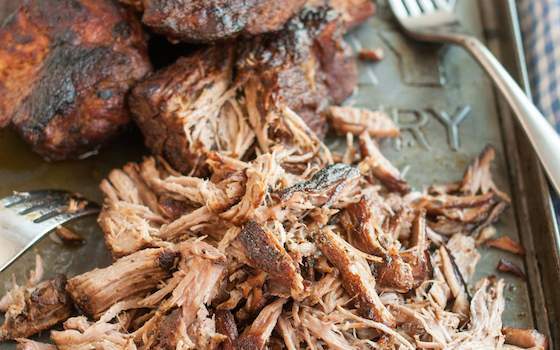 The robust flavor is an excellent complement to the pork. When peaches appear in our summer markets, most of us think immediately of using them in luscious desserts such as pies, tarts, shortcakes or homemade ice creams. The truth is, however, that this fruit is just as tempting in savory creations. A fresh peach salsa paired with sauteed pork tenderloins is a good example. 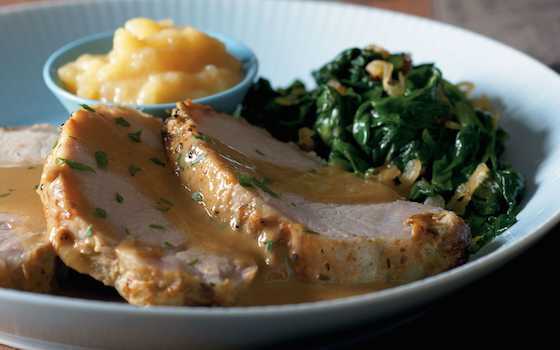 One of my favorite main-course combinations to cook is roasted pork with apples. Pork is such a wonderful meat. It's full of hearty flavor and texture, yet also mild and sweet. Apples, with their tangy-sweet flavor and crisp, juicy texture, pay the perfect complement to pork, resulting in dishes that are satisfying and down-to-earth. A recipe you can dress up or down, that's comfortable in a breakfast, lunch or dinner menu, and that always makes you look good as a cook. It's called maque choux (pronounced "mock shoe"), and unless you're from Louisiana chances are you haven't heard of it. Think of the best of the harvest -- sweet corn, tomatoes, peppers and onions -- coming together with butter and seasonings, and you've got maque choux. The following Sausages and Peppers in Beer recipe calls for chicken- or turkey-based sausage. Both deliver the taste and texture you enjoy in sausage, but with less fat and fewer calories than the red-meat counterparts. Comfort food is popular any time of the year. Pan-grilled sausages served with braised red cabbage and apples definitely falls into this category. Robust and hearty, this soothing duo is simple, fast, and inexpensive to prepare. If, like me, you enjoy hearty meat dishes, but want to cook simply and healthfully, I recommend you try this sausage and scallop stew.